Approximate Capacity: over 1000 wine corks. An accent piece with personality, our Wine Barrel Cork Catcher creates a nostalgic collage of great bottles shared with good friends. Uniquely sized to function as a small table, the central plaque is a 'blackboard' that invites you to chalk your thoughts, sentimental and otherwise. The vintage design is beautifully handcrafted in metal with a black finish and a hinged wooden top that opens so you can easily toss your cherished corks inside. Is this item black? Or dark brown? The base is black matte type finish & the top is more in the mahogany family then a true brown. Its a great/fun piece for the price. The flat top is a very dark brown. The metal sides are black with an oil-rubbed bronze hue to them but it is very faint. i would called it a distressed bronze. Top is more dark brown and chalkboard closer to black. It is a very dark brown, but sometimes in certain lights it does look black! BEST ANSWER: Table top measures 10.5" across the top, the table has been very functional as an end table. 10 and one half inches in diameter. The diameter is 10 1/2 inches. Is this big enough for wedding cards? I was thinking of using this for a wedding card holder and then use it in my home. BEST ANSWER: The Barrel Cork Catcher Accent Table is 20 inches high and certainly big enough to hold all your wedding cards. There is a plaque which is a blackboard where you can write something personal and you can use it after the wedding to display all your corks. Congratulations on your upcoming wedding. This would work great for receiving and holding wedding cards. I tried it out using a wedding card we just bought for an upcoming wedding. This Wine Cork Barrel is over 20 inches high. I have approximately 1500 corks in it. I have never used it for wedding cards. yes I think it would hold wedding cards. They would not go through the cork slot but there is a door in the back. Yes it is!! What a good idea!! It will hold many cards!! Can this and the cork holder table be use outside/ patio areas? BEST ANSWER: Because it is metal, I might be leary of that. But perhaps if spray painted with a sealer, then I would say go for it! I would not put it outside. For one thing, after some storms, I think the corks would get extremely grungy. It could be used outside, but I would not keep it outside if the area is not covered. OK, in a covered patio. It could be used outside, but I would bring it inside after. WOULD NOT HAVE IT OUTSIDE , BUT IN AN ENCLOSED AREA WHERE IT IS PROTECTED. I would think that the climate would play a big part. We live in Colorado and I wouldn't trust it outside. Item # 3311302 in your recent catalog had PEACE on the cork catcher accent table. That is the one that I want to order but I am not able to do so. How can I order a cork catcher with PEACE on the front? BEST ANSWER: The Barrel Cork Catcher Accent Table and many of our other cork catchers have blackboard plaques that you can write your message in chalk and then easily wipe clean to change your message at any time. The cork catcher table front is chalkboard material - you can write on it with chalk whatever you want. It's a fun piece to have and I get a lot of compliments! The front is just a chalk board. You can write in whatever you like. Where was the table made? BEST ANSWER: I have 2 of these...and luckily I kept one of the tags..These are made in China. I couldn't find out where it was made but it is a good table. The Barrel Cork Catcher Accent Table is made in China. China or somewhere else in Asia. It's terrific. The video says this table holds 500 corks, the print description and catalog says 1000 cork capacity. Which one is correct?? BEST ANSWER: Well, I’ve never counted the corks that I’ve put in; however, I drink plenty of wine and it’s only about a third full. With that in mind I’d say it will hold over 1,000! 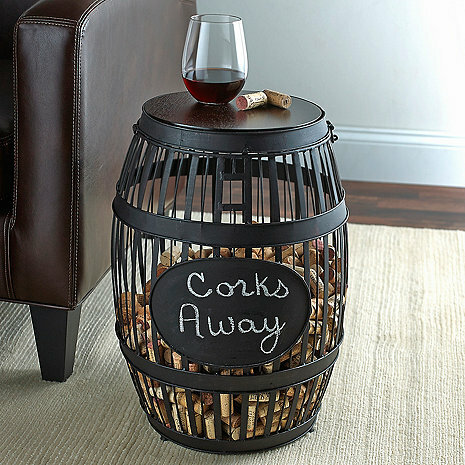 The Barrel Cork Catcher Accent Table holds approximately 1,000 corks. The description says the top is wooden but I just got mine and the top is black. Why? BEST ANSWER: Mine is also black. But I like being able to use chalk on the top and front of the barrel to mark special occasions. Would could have been a problem, so I'm OK with the metal. Hmmm, I ordered mine about a year ago and my top is wooded. Possibly the manufacturer changed the type of top without Wine Enthusiast knowledge of this change. I don't think it is wood either but rather some type of composite material. Yes my top is black but black looks good on the unit. The cork catcher is made well and looks great. The only fault I found was that it was advertised to store approximately 400 corks when in reality it will store approximately 1400. Now this is what a wine drinker needs! I love it. I move corks from my smaller holders into this one. My friends and family sign corks so we remember the experiences. The one downfall is that there was no chalk. I found a chalk pen at Pier One but wish it would have come with the product. Love this table height cork holder! It's a fantastic accent piece. 630 corks and we are, perhaps, half full. Now aiming to complete the job over time! This product is a well made and functional way to save your wine corks. It is a little on the short side for use as an end table with my furniture but I could see it in that role with shorter chairs or couches. I plan on laminating several wine labels to glue on the blank surface which was intended for writing on with chalk. Great way to store your corks- and memories of great wine with family and friends. Love it. We save all our wine corks, maybe someday we'll come up with a use for them, and this is a great way to save them and generate comments from our guests! Not sure. Gifted your product to a wino. Hopefully it stays on end. Thanx for it being pre assembled. The cork catcher is even nicer than I expected. It makes for a novel conversation piece. And it is a convenient place to store all of our corks. This is a very nice accent piece. It is VERY roomy that many corks can be stored. I "loaded" mine by ordering a bag of 100+ corks to get it going. I wish it was a few inches taller to function more as an end table. But it looks nice, very sturdy construction, arrived super quickly. It has sparked many conversations during social gatherings. There were only two things I had issues with on this purchase. First the lid could use a little heavier hinges because when I received it, I had to bend them until the latch was aligned, and second while not a problem, I wish it was about 4" taller only because I have oversized furniture and its a little on the short side to use as an end table. I love this. Holds my growing cork collection and looks cool. Perfect addition to any area that needs either an extra table, extra decor, or both! It would've definitely been nice if it came with chalk but not the end of the world. Worth every penny. It is perfect. Now we have somewhere to put the corks. Though it does make for sometimes awkward questions. Like..... Man you guys drink a lot of wine!!! Then our answer is Yes we do!!! I am sure I will be buying this item again! It's the right height and size to side beside a couch and not obstruct the flow of traffic - very pleased with it! This is a great way to store/save your wine corks and who doesn't need an extra end table. Very unique and fun gift for anyone who drinks wine. I like the finishing of this item and the size allows for placement in many spots in the house. Great accent table to have if you enjoy wine and want to save the corks. This table arrived fast and was packaged well. Would high recommend this for anyone that loves to save corks. I have 2 of these and I love them..I have ordered many cork holders....this one is the largest I've found ...the best made and most versatile in its use....I will eventually need more...give this product a chance ..remember this company works with you when you are unhappy. It was better then I expected. I love it and get lots of compliments on my new accent table. I received this table a month ago and love it!! We had a lot of corks in different places throughout the house. This keeps all of our corks in one place. I love the chalkboard plaque. It's well made. For $99, you can't beat it! Great way to store corks from wonderful wines! Like the barrel shape. I am very happy with this table. It is sturdy and just the right height . Also a great conversation piece too! Would highly recommend this table . PLus my son in law wants one too ! Very nice functional conversation piece. Very nice functional conversation piece.Write your review here. It must be at least 50 characters long. Consider whether you would recommend this product and what you like or dislike about it. This cork barrel is great, would definitely recommend! I was happily surprised by the quality of this barrel table. Sure it is not heavy wrought iron but it is great for what I purchased it for - a side table that also stores the hundreds of corks we have accumulated. Looks great in our reading room! This is the second cork catcher we bought, the other one being the wine glass shape. We have them on either end of one of the couches in our living room. They are great accent pieces. The only problem is we now have to drink twice as much wine to fill them with corks... well, really, it's not a problem! This little table is perfection-it's an equally elegant and fun piece to have in our living area. And, you can put your corks in it which adds to the look. Was a housewarming gift from my dad and it is wonderful! If you're looking for a viable option to hold a large bunch of corks, this is your choice. I have more corks than in the picture, but yet the barrel still has room for quite a few more. It's well made, will double as an end table or just great storage in your bar or wine cellar. It is exactly what we hoped it would be. High quality- first time we’ve ever ordered from this company. Conversation piece! Perfect for collecting corks in quantity. Great look. Love it, will definitely recommend to others. It is a Christmas present. Well made product, delivered quickly. Friends enjoy adding to the collection...now it's a pool to see who can guess the number of corks it will take to fill our new table. Great accent piece. Perfect extra seat and beautiful display of all of our corks. Very nice accent tableâ? ?Fits in nice. Just a little short is all. We love the wine barrel for corks. It's a fun accent piece in our dinette where we also have a wine rack. Cute. Great table. I love the way it looks in our den. Fun write in the label. I absolutely love it. It’s the perfect accent table. My apartment is tiny and it’s a wonderful conversation piece as well. This accent table is better than I imagined it would be. It fits in my living room perfectly. What a great table for the wine lover in all of us! Perfect cute side table to set drinks (wine, of course) on. Love finally having one spot to collect our better corks. Fun conversation piece! This was a present for my best friend and it is loved...great quality construction. This cork barrel is just the right thing to contain all my corks and I will be ordering a second one. We love it! It is perfect next to a small chair. Right now we put 1 cork in it...lol. Perfect price for a fun accent! Love these accent tables in our lower level TV room and bar.